BAS > News & media > Latest blogs > SCIENCE IN THE SEA: You study what? 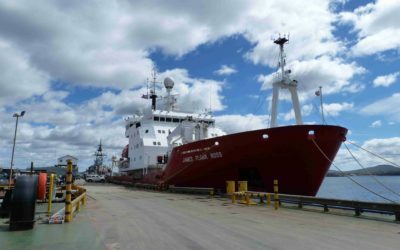 Dr Mel Mackenzie, a Collection Manager of Marine Invertebrates at Museums Victoria in Melbourne, is living and working on board the BAS research ship RRS James Clark Ross for the exciting Larsen C Benthos research expedition which is currently heading south. Once the team arrives near the Larsen C Ice Shelf, Mel will be working to retrieve, sort, identify, document and preserve marine invertebrates from the ocean floor. 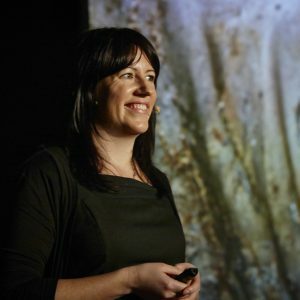 Read on to find out more about the creatures Mel hopes to find and why they’re an important part of a unique ecosystem. I have a special interest in sea cucumbers (known as holothuroids), and have studied animals from historic and recent Antarctic expeditions with mentor and museum honorary associate – Mark O’Loughlin. This is the general reaction I get when I explain that I study sea cucumbers. As echinoderms, sea cucumbers are related to sea stars, brittle stars, urchins and crinoids. Sea cucumbers have been around for over 400 million years and come in all shapes and sizes. They may not look particularly charismatic from the outside, but their skin is filled with ‘ossicles’ which viewed under a microscope can look quite beautiful and importantly help to identify a species. Sea cucumbers use hydraulic pressure to power their tentacles and tube-feet, can reproduce in many ways (even by splitting in half), can breathe through their butts, vomit in self-defense if you squeeze one, or shoot predators with sticky, toxic tubules. Some even brood juveniles in neck pouches or carry babies on their back. 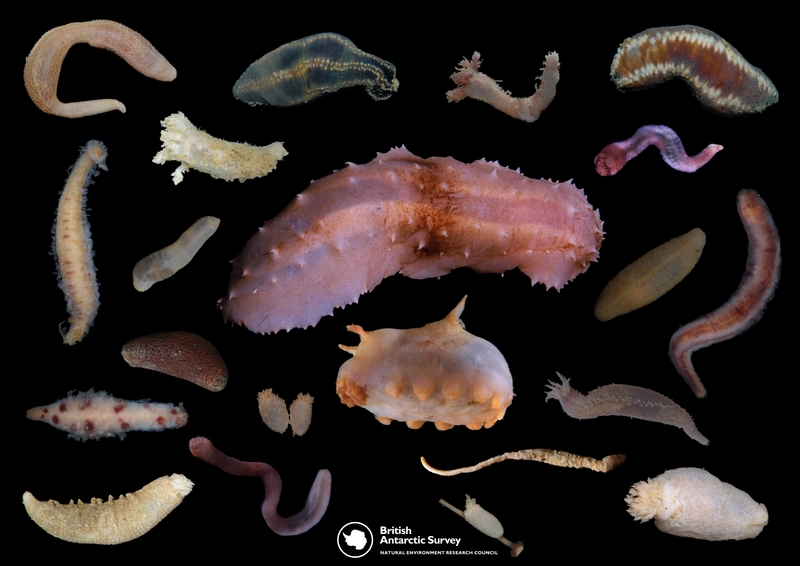 Forget penguins and whales, sea cucumbers (and other invertebrates) rule the Antarctic seafloor. Who says you have to be cute to be cool? A collection of Sea Cucumbers. Photo credit: Huw Griffiths. 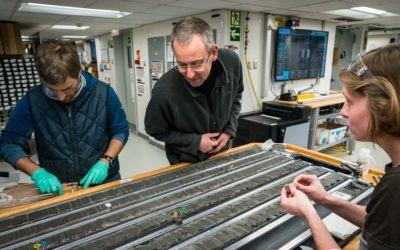 For the Larsen C Benthos cruise it’s too deep, cold and dangerous to dive so instead we’ll deploy specialized scientific equipment and cameras to get a snapshot of this under-ice ecosystem. An example of equipment which can be deployed from the RRS James Clark Ross, to sample and observe the seafloor. 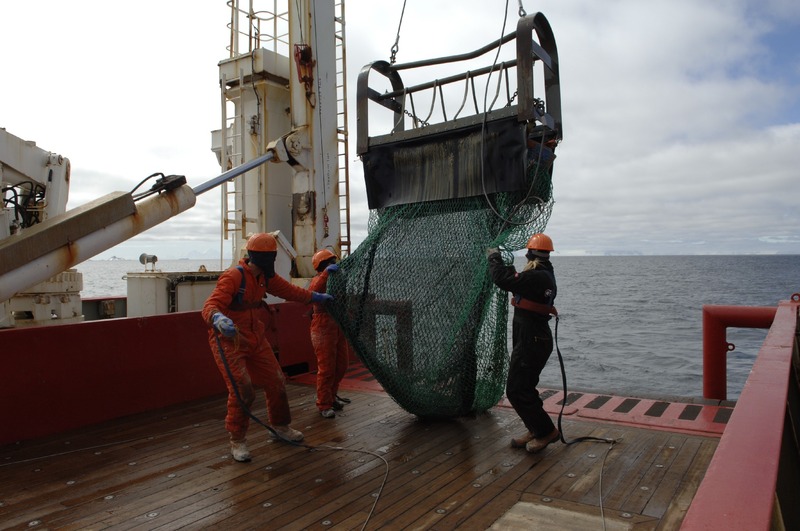 The Agassiz Trawl is towed along the seafloor at any depth with a net to collect animal samples. Photo credit: Pete Bucktrout. It will be quite the adventure working our way through the sea ice to get there, and I can’t wait to find out what sea cucumbers have been living under the Larsen C iceberg A68 and how they compare to species and groups of animals found in other deep sea and Antarctic waters.